Airing My Laundry, One Post At A Time...: How Many Presents Should Kids Get During The Holidays? 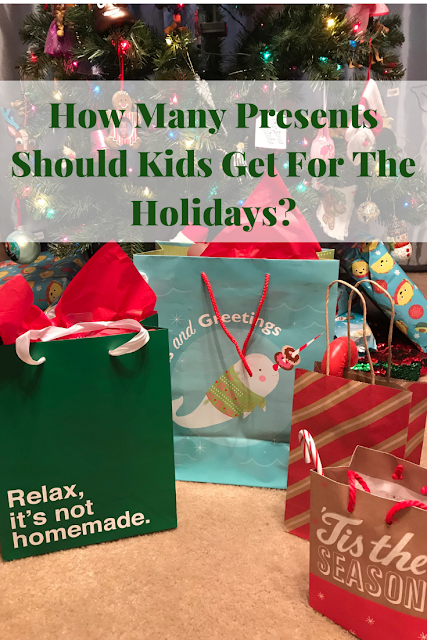 How Many Presents Should Kids Get During The Holidays? So, okay, I've noticed there are all sorts of stories popping up on Facebook about how many presents a kid should get during the holidays. I guess I'm baffled because really, what does it matter what another family does? You have some parents who are all, "We follow the 4 gift rule! Something they want, something they need, something to wear and something to read." And it's like, good for you Susan, you do you! We do 4...times 3. Some are like, "I don't give my kids that much because I don't want other kids to feel bad if they don't get as many gifts." Amazing, great, but shouldn't children know that life isn't fair? I never once as a kid thought, "Oh man, why did Katie get more gifts than me? Am I bad?" I mean, seriously. Look, I totally get that you shouldn't spoil children. You want them to be grateful for what they have. You want them to give back. And my kids do. We always donate toys for Toys For Tots, plus they give their old toys to charities. There are always coat drives during this time, so we like to donate to that too. I think it's important for kids to know that not all families are as lucky and that you should always be a kind person and do what you can to help. So how many presents SHOULD kids get? As many as you want to give them because they are YOUR kids. Don't listen to other people. Make your own rules. If it feels right to you, awesome. If you want to give your kids 4 gifts, great! If you want to give your kids 20, that's your business, and don't ever feel guilty for it. this is amazing, obsessed with this article. You don't agree with letting parents decide for themselves how many presents their own children should get? They received more when they were younger. Older they got more expensive the gift so less was received. My kids I will do what I feel is necessary. I really love this post. As with everything else in parenting, it's a 100% individual thing. Pretty callous to say that poor kids whose parents can’t afford gifts should learn that life isn’t fair. Pretty sure they know that when they stand out in the cold without a winter jacket! I’m imagining my kids at school telling their friends what they got for Christmas and a less fortunate child shares they got none, I can only hope and pray that my kid wouldn’t come back with “yeah well life isn’t fair”. I do agree that it's up to the family how many gifts they should give their children. When the kids were younger and still played with toys, we always got them too much. There were always toys that never got played with. We've tried to become more careful and thoughtful over the years. To address the issue of different families receiving different amounts of gifts, we've tried to teach the kids that they don't have to tell their friends about every single gift they get for Christmas. It's okay to just mention their favorite. Exactly! My kids know this as well. No matter the number of gifts given, one or a hundred, as long as it comes with love, any kid will appreciate. Absolutely, I so agree with this! Doesn't matter. It's not the number of gifts a kid receives, it's the thoughtfulness of the gift giver. We must teach our kids to be gift givers as well as gift receivers and show appreciation. It is a parents choice for sure. But should be looked into very carefully not only for finance problems for buying too much, but also teaching the child about giving themselves. Parent's choice but here is a nice rule: Want, Need, Wear, Read. My mom used to have us donate as many toys as gifts we wanted. Talk about making good choices! We actually follow the something to wear, something to read, something you want, and something you need rule for their gift lists. They do get additional things in their stockings. It is up to each family on what to get their kids. With 4 kids, we only have a limited budget for gifts. I agree that it is up to you on the present count. Now that my kids are getting older I am giving less gifts and we more experiences. Experiences can be so much better! I might do that one year. There's so many places we want to go. Yeah, I agree that it is up to the parent. We did a varying number of gifts for our kids. I agree. We always give back. I think it's important for kids to do. I wasn't rich either growing up, but I also never compared myself to others. I think it's easier to compare these days thanks to social media. We always make sure to donate to children in need as well. I think everyone should do that if they are able. I totally agree with this. As a society we are so concerned with what other people will think of us as parents. It seems like at the holidays parents try to compete. We just need to do what feels right as parents. And, you are right we shouldn't feel guilty for giving 4 or 20 gifts. Great points. I think it's all about what a family can do and what they are giving. I totally agree with you! And the whole thing with people going on social media, it just turns into a disaster. Either taking pics of some gigantic pile or expensive stuff and bragging, or judging others.. just be kind, do things from the heart and think about how people feel. You made some great points. Thanks for sharing. We have to figure out what works best for us. I don't compare my children to others, I figure out what works best for my family. And I roll with it. Because we never know the situation, rather it is buying four gifts of 12 gifts. I totally agree with you! We do three gifts representing the three wisemen. I do it to keep our cost down. We do stockings still too. Its always the thought that counts. Nowadays, they just wanted to receive gifts so that they can show something on their socials accounts :) Not all but most of them do...We need to manage their expectations too. We try to keep it to a dollar amount per child. The older ones know they may receive less because their stuff is more expensive than the little kiddos stuff. It was definatly easier to buy more when we only had 1 child, now that we're going to be a family of 4, Christmas gifts may be changing. I completely agree with you. It should be what is within your means and what ever you choose. Love this article. It's all about each family doing what is best for them. Nobody knows your personal situations better than you. I couldn't agree more with this! I think people have to stop judging others so much and let people do what's best for their family! This is a really good question! I think a lot depends on the child's age. As kids get older they want tech gifts which are very expensive. 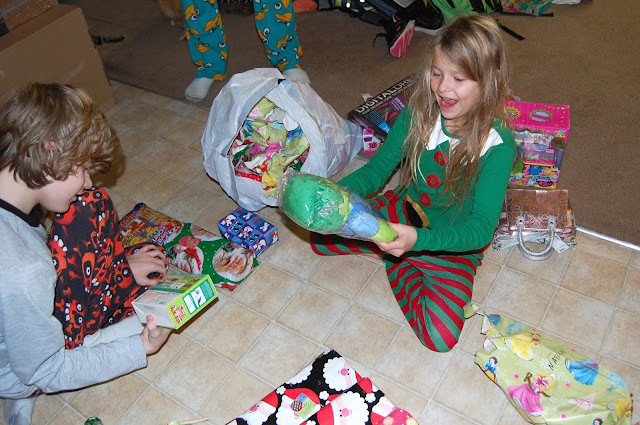 We always made sure that each child had age-appropriate gifts that were within a set price range per child. Yup. Your choice for your kids. I give SO much to other families around here. I mean.. boxes upon boxes of stuff from work. I want to give my kids toys because I can.. so sue me, sanctimonious people on Facebook! I agree. I'm doing what works for my family and everyone else should do what works for theirs. You are a kid only once. So I think it is not right to restrict the number of presents. A kid should get as many presents as he can. This post is tone deaf. Your argument that every family can make their own decisions fails to account for the families for whom there isn't a decision because they don't have the means. I don't think there needs to be a universal rule of gift giving for Christmas -- that's unreasonable -- but you could take a step back and recognize the privilege you have in being able to say something like this. Also, your kids are old enough to understand that the gifts come from you. For kids who believe in Santa, it can be hard to understand why the kid at school got an iPad and a video game console while they got a sweater and a book. I think the irony here is you writing that people should be kind while also saying that kids need to learn life isn't fair. If you could heed some of your own advice and demonstrate kindness, this post could have been written from a positive lens of Ways Your Family Can Give Back During the Holidays and have left a much better feeling for your readers. I totally agree with you! The only thing I have ever tried to do was make sure each child gets the same amount of gifts. Some years that is easy while others it is not. Great ideas and I totally agree on not worrying about what others do. I usually give my son one large one or expensive one and a few small things! What the 4 gift rule doesn't take I to account is that sometimes lots of "things" get wrapped into one gift or that one gift is a really expensive gift. I can't afford large, expensive gifts for my kids, and they are still little and are more excited about ripping off the paper and seeing what's inside than they are about the actual gift. I buy and wrap up lots of little things for my kids. I don't feel like I'm going overboard because I'm not spending as much as I was with the 4 gift rule. I also do t have the pressure of making sure I don't "waste" my kids one "want" gift on something they don't love.